Where to begin; I guess I should state that invariably I play games and read books about historical happenings. That is not to say that I forgo what ifs as long as they are plausible. I usually steer clear of alternative history or, for want of a better term, imagined conflicts. The background story isn't really flushed out, but it seems plausible enough. 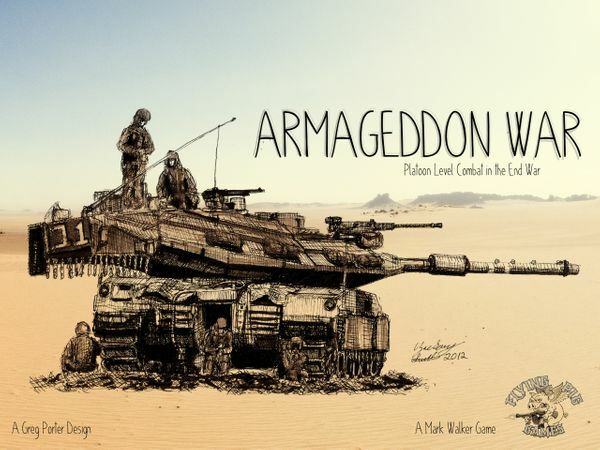 Armageddon War is based on a conflict that breaks out in the Middle East in 2028. 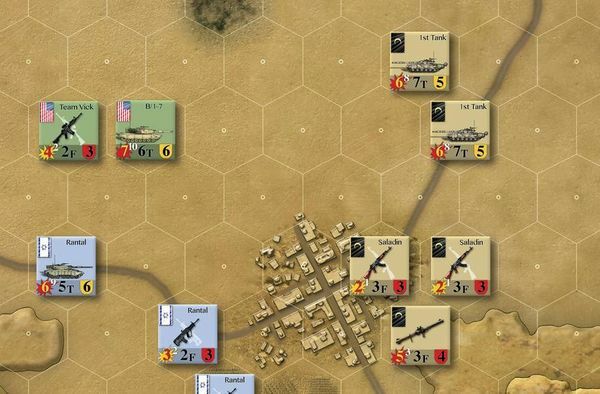 To quote the rulebook," Geddon war has conflict between disorganized and poorly equipped militias, advanced weapon systems barely past the prototype stage in the hands of highly disciplined First World forces, and everything in between". 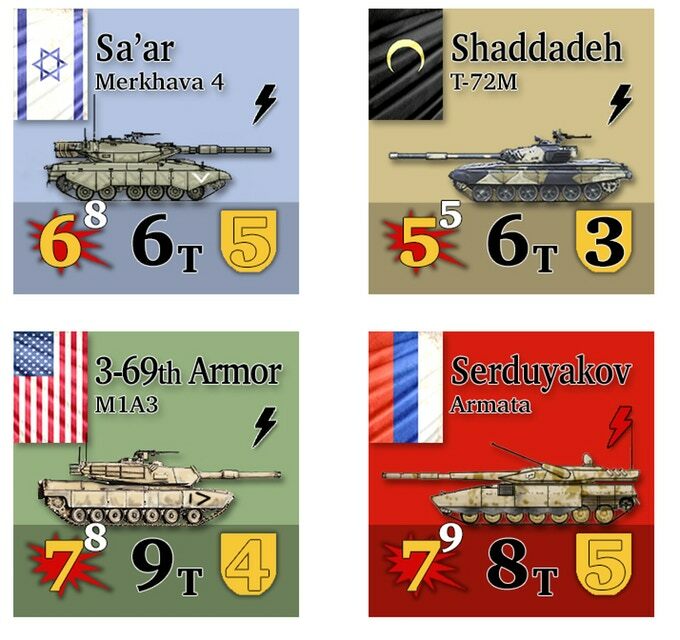 So the player will be able to use a goulash of units from nowadays to some interesting possible future weapons. It is a platoon level game. So the scenarios run the gamut of small knife fights in urban areas to full blown battles of armor. The maps are mounted, and visually are very well done. The hexes are oversized, as are the counters. The counters are in line with other games from Flying Pig Games, meaning that they drop out of the sprues if breathed on, and are small pieces of art. The players' aids and rulebook are also easy to read, understand, and strikingly colorful. The game turns are fifteen minutes per. So, one of the problems that the game designer had to deal with is that most of the weaponry could fire off its allotted ammunition in less than a third of a turn. You will have to take the designer's ideas of what the new weapon's offensive and defensive capabilities are. However, these are always what each designer believes, so there is nothing really new here. With other games the designer does have the real world statistics and usage to go by. The game has opened up a new avenue of research for me. I was pretty much in the dark about the weapons that have or are just coming off the drawing board. The Russian Armata tank is one of these. Who knew there was an actual tank with a turret that was fully automatic, and the tank only needs two people to run it. The game designer does explain that because of the lethality and range of these newer weapons that he had to adjust some things. The hexes on the map represent 150 meters each. The range of some of these weapons are theoretically bigger than the map. He also explains that the casualties are not just actual losses, but the loss of the unit's effectiveness. So how does it play? Just as in the real world, the actual armed forces of the combatants have tremendous killing power. The militia forces cannot stand up to them, at least not in the open. The lethality of the weapons mean that the best laid plans of mice and men literally go up in smoke. The air units (helicopters and drones), have only one damage step. Ground attack aircraft are not actually represented on the map. Their offensive capabilities are represented by the off-board munitions. This was probably done to simplify the game, and not make the player also have to deal with too many extra AA rules etc. 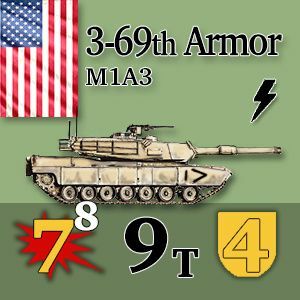 This game differs from most tactical platoon level games by taking into account logistics. As mentioned, the units in the game could fire off all of their munitions in less than one turn. So this game system uses Logistic Counters to keep your units at full strength for fighting. These counters must be placed outside of any enemy's line of sight, and no farther than two hexes from a friendly unit. The Logistic Counters can move up to three hexes in a turn, but must end up in a hex that it could have been placed in originally. The game also has no CRT. All of the combat and defense is predicated by the dice. It is a simple way that some games have removed the style of play of, I have three to one odds so I will attack etc, method of play. It just adds that much more 'fog of war' to game play. You can still see if your attack will have any hope of success, but you will not be able to calculate it that well. 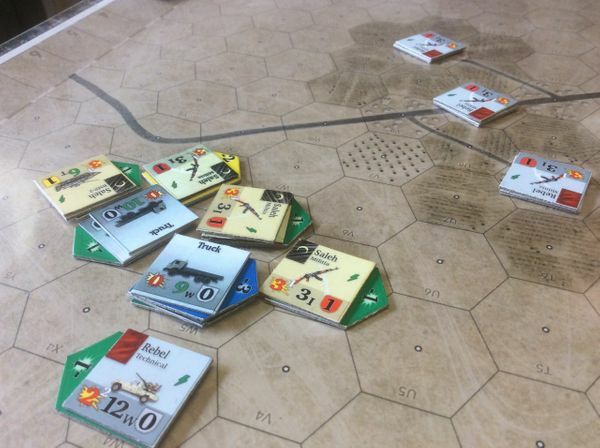 This mechanic adds more of the 'friction' of warfare to the mix. I was fully prepared to not really enjoy the game. I really like Flying Pig Games components; I also really like the way their rules are done. Can you tell I like their games? 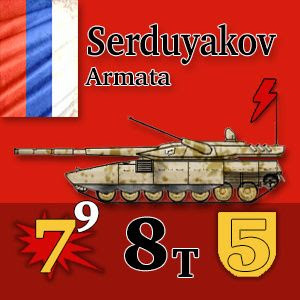 The only problem being was that a conflict in the Middle East, and especially one that is in the future, was not something that grabs me for wargaming. I bit the bullet and dove in. I can state that I was very, very wrong. Once you get into the game and its mechanics, you will find it is excellent. The game has many innovations that just work really well. I have to thank them again for going with large 'old man' counters. No need for tweezers and a magnifying glass here. So, like me, if you are hesitant about the actual area and time of the conflict, you should look into and get the game just for the system and the game components. I will be doing a followup review on the solo expansion "Alone in the Desert'.